To celebrate the release of GIRLFRIENDS’ GUIDE TO DIVORCE, out on DVD from 8th February 2016, we are giving 1 lucky winner the chance to bring home a DVD! GIRLFRIENDS’ GUIDE TO DIVORCE follows Abby McCarthy (Lisa Edelstein – House), the self-help guru and best-selling author of a hit book series as she struggles to maintain her reputation after separating from her husband. Finding her life in free fall, Abby sets out on a journey of self-discovery comically stumbling through post-marriage hook-ups, single parenthood and a wild trip to Las Vegas. Supported by a new group of divorcee friends, join America’s once-favourite girlfriend as she tries to figure out life as a newly single woman in her 40s – learning a few lessons along the way! 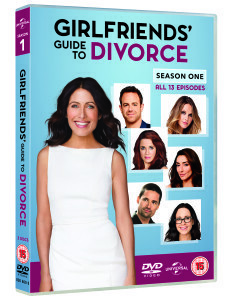 Get ready for tears, laughter and a little bit of love with GIRLFRIENDS’ GUIDE TO DIVORCE as it releases on DVD on 8th February 2016. The competition ends at 23:59 on 22 February 2016. The prize consists of a Girfriends’ Guide To Divorce Season 1 DVD.